LAWRENCE — Jayhawk Student One Stop is a new service launched through efforts of the University of Kansas Office of Diversity & Equity. The program strives to offer students who may not know where to turn, answers to their KU-journey questions. It can also help students navigate university policies and practices, especially when the student may be experiencing a range of single or simultaneous crises that, if not addressed may inhibit their ability to focus on their academic program. 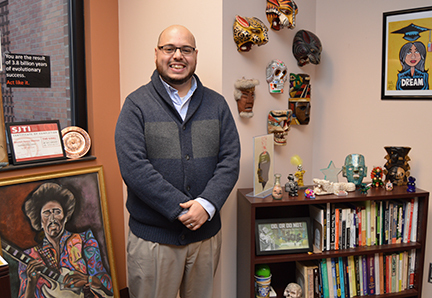 Mauricio Gómez Montoya, who has successfully navigated many KU students to success, was recently named the director of the program, located in the Sabatini Multicultural Resource Center. Jayhawk SOS will be available during regular business hours on weekdays. To better understand what the program can offer KU students and what it hopes to achieve, Gómez Montoya agreed to a Q&A. Q: For Jayhawk Student One Stop (SOS), what is the concept of the program and why did the team opt to use the distress call as its acronym? The concept of the program is basically to provide KU students with equal opportunity to be successful at KU. The purpose of the office is to support students who are experiencing unforeseen challenges, to be able to navigate the institution, to persist and graduate. Why did we opt to go with a distress call? I think we wanted to make clear to students that this was a resource to help them through difficult times, and specifically knowing that some students have some reservations around asking for help. We’re trying to normalize the idea that asking for help is a good thing and is, in fact, the mature thing to do. SOS suggests that you need help, and Jayhawk SOS is the place that you can get it. Q: How is this position different than other student service-oriented positions on campus? The main approach is a case management approach: I will serve as a broker for students. I will represent them and act on their behalf, still with the student highly involved in the process, but helping them navigate the institution. I think one of the things that makes SOS a little bit more individualized is the personalization of the support, which may or may not be possible for other offices. Personally and professionally my philosophy is always “Student First.” The institution needs to do what it can to support students within the limitations of our policy and resources. But I do think that being a "student first" mindset even helps the narrative of the office in the way that students interpret what we do and how we serve them. Q: What can students come to you for? I’m always an advocate that experts should be allowed to do expert work. My role here is to help students who are in need of an expert and point them in the direction of that expert, whether that is me or somebody else on this campus, because we do have a wealth of skill sets and talent. My hope is for somebody to ask for help when they feel in distress, when they feel overwhelmed, when they feel they are not being supported or listened to. But I also want to make sure that they are utilizing the resources that they have as well. Of course in a perfect world, all students would know to which office to turn; which questions to ask; and they would do this before a problem becomes a crisis. For example, if the question is academic, it would be a good idea to chat with an academic adviser because they are the specialists around academic issues. If they have a question around financial aid, they need to begin with Financial Aid, because they are the experts. However, not all students come to KU feel empowered to ask questions, even if the question is simple. So my office is here for them. Asking for help is not overtasking me. In fact it’s my duty. It’s my job. Q: You have worked at KU for many years and in several different capacities. Can you share some of that history? My first job was retention specialist with the Hawk Link Program. My position was tasked with providing support to students in the program through advising, instruction of UNIV 101, instruction of Liberal Arts & Sciences 292 — or LA&S 292, programming, recruitment of students, etc. But really my job revolved around providing support of marginalized students in their first year on campus. Q: What special training or experience do you have that will impact the student experience? I think the primary training that I have is that I used to be the student. I used to be the student who needed help. I used to be the student who sometimes was hesitant to ask for it — a little too proud, at times — and it was to my detriment. So I know what it can look like to not ask for help. I know what it feels like to receive it when you need it, even when you’re not comfortable asking for it. I think the experience of being on their side of the table has been really helpful in understanding some of the circumstances they may be bringing up. A little bit more professionally, my entire professional career has been revolving around the idea of supporting retention and persistence of students — working with multiple populations of students, from first-generation students to students of color, low socioeconomic status, international students, domestic students. And then around the idea of cultural competency, yes I am Safe Zone trained. Every few years I try to go back into it and renew my training just because it’s an ever-changing field. I have attended the Social Justice Training Institute. I have facilitated the student experience for Social Justice Training Institute, as well. I facilitated a myriad of programs around social justice here on campus, Colors of KU, trainings for different staffs in Housing, First-Year Experience, Undergraduate Advising Center. Q: For this to be successful, students really have to open up and trust that you can help them. What would you say to the student who is hesitant to see you? It is the case that many students feel that KU is a place where they don’t belong. They may blame themselves when things get difficult and are afraid to ask for help because they don’t want anyone to know that they are having a hard time. For many, having a hard time is often perceived as, “I don’t belong here at KU.” It is our job to make sure that students always remember that they “do” belong at KU. For this to happen, it’s important to establish trust early. I would say it’s the cornerstone of any successful student service and resource experience — for the student to feel they can trust you, to feel safe, to feel seen. Without that it’s probably going to be very difficult for the student to be truthful and honest about their situation. I would say that in order for me to establish a relationship and initial trust with a student, one of my strategies is to open up myself. I think it’s important for them to see me as a person who has good days and bad days. I do think in order for us to establish trust there needs to be some vulnerability and some honesty — a lot of honesty. And the student needs to feel seen, needs to feel safe, and needs to feel respected. Q: If this is too successful, how will you handle overcapacity? That is a pressing concern. That’s why we are drafting – for lack of a better term – a crisis chart that will basically help us determine at what point intervention is needed and who needs to lead that intervention. I envision that Jayhawk SOS is going to be helping students who may have already been in multiple touchpoints and perhaps may not have received all the support and guidance that they need. Hence, they are at my door. My office will provide assistance to as many students as we can and will do so by partnering with experts across this campus. As I said earlier, I do believe in allowing experts to do expert work, and my role is sometimes a connector, sometimes taking a lead, sometimes it’s simply just providing support. Success is not something that happens in isolation for our students, nor for our student services. The ability to identify resources, use our networks and build collaborations is key. Q: What is special about this position? What are you excited for? The most special part of Jayhawk SOS is that it’s personalized; that it really intends to address the specific concerns of an individual student. Another thing that I think is special about it is that we have support from our campus to do this. I think I am, and we are as a campus community, very lucky that we are supported by our leadership to do this — that they feel this is important in that they are actually putting resources and allocating staff to tend to this. The Office of Diversity and Equity, which is the office that created Jayhawk SOS, has taken seriously the concerns raised in the recent Climate Survey. Specifically, students were concerned about “belonging” – much of which is linked to what they feel and we observed are gaps in support, especially for students who are most struggling with one or more issues such as financial aid, housing, food insecurity, underrepresented and marginal identities, and poor academic performance. What I’m excited for is to serve students. I got into the business of higher education because of students. I really look forward to those moments when students overcome that challenge and succeed and graduate. I’m really looking forward to seeing some of the folks that are going to be using the service. I want them to truly benefit from what we offer and take advantage of the tremendous advantage that is to go and get a college education. Q: Can all students use you as a resource? The vision is to help all students at KU, to be a resource for graduate and undergraduate students who are in need of assistance, especially those who identify as marginal or minoritized. And I think the bigger part of this is that they should feel this is a place for them where we are going to do what’s in our power to support them and to help them. This is a service open for all students, and they should feel empowered and entitled to utilize it. Q: Are there important thoughts you want others to know? My vision for Jayhawk SOS is for it to be a collaborative entity. I want to ensure that we are tapping into the expertise of campus partners. My hope, my goal, is for Jayhawk SOS to collaborate heavily with all the experts that we have on campus and really utilize the resources they have to offer to the extent that we can. We do have a myriad of talent on campus. The mantra in student affairs is “meet students where they are.” So we definitely need to make an effort to find them in a noninvasive way. My hope is to engage with some folks, maybe tweet out not just what our office is doing, but other opportunities that campus is providing, perhaps some helpful articles — anything from financial literacy, to get your flu shot, to explaining how insurance in the health center works — any tidbit of information that may be helpful for students. I think we sometimes forget that students are whole people, and we forget that they sometimes have financial concerns, or personal concerns or health concerns. I think it’s important to see them as whole individuals and take that wholeness into account. My hope is to engage with them in more than just a reactive way, perhaps in a preventive way.